This tiny pendant is a collaboration of British artists. The design is handmade with delicate copper wire work, capturing the movement of a leaping hare. Artwork by Tracey of Moongazey Art. Wire work by Nicola of Earth Balance Craft. This pretty copper wire work necklace design follows the beautiful curvy contours of the male peacock feather. With a beautiful shimmering green, teal and blue colour palette, adorned with semi-precious gemstones and glass. A copper wire work pendant outlining the delicate contours of the fern plant, wire-wrapped with moss agate, Indian agate and Chinese Jade (jadeite) semi-precious gemstones. This organic design is inspired by the spiralling fern frond, when woodland is springing to life with the beautiful un-twining coils of the vibrant green fern. 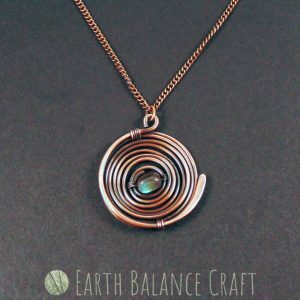 This spiral pendant is hand-made with oxidised copper wire work and a labradorite gemstone. Inspired by my ever lasting love of the British weather, the looming sight of stormy grey rain clouds that frequently grace our shores. 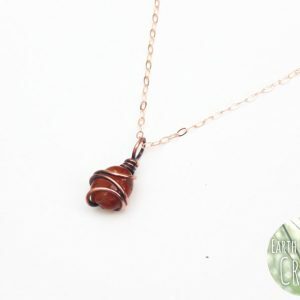 This tiny hand-made copper pendant features a delicately wire wrapped hessonite garnet stone set on a dainty rose gold chain. The minimal micro scale design is inspired by late summer when the hedgerows are filled with ripening brambles and berries. A curved copper bar necklace adorned with oval garnet and moonstone beads. A design inspired by late summer, with a morning mist swirling over hedgerow shrubs heaving with ripe berries. The deep shades of red garnet contrast with the watery moonstone beads and dappled coppery metallic tones. The necklace is designed to sit delicately just below the collar bone drawing attention to the décolletage. 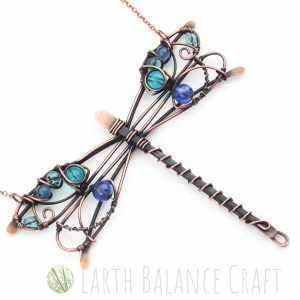 This teeny dragonfly is hand-made with copper wire work, gemstones and glass. Designed with an elven flare, for all faeries and forest dwellers out there. Inspired by summer time river walks, when river darters buzz around the waters edge showing off their metallic azure blues. From a range of wildlife inspired jewellery designs for women. This memorial pendant is of a white butterfly, designed as a gift for remembrance symbolising the spirit of loved ones who have passed. The design is hand-made with copper wire wrapping, white gemstones and Czech glass set on a 20 inch necklace chain sitting a few inches below the collarbone. Inspired by ‘Wood White’ species of British butterflies, with his distinctive delicate grey white wings, this design embraces the beauty of British wildlife and captures it in wire art. A spiralling rain cloud necklace design, adorned with beautiful rain drops of labradorite and kyanite. This piece is inspired by my ever lasting love of the British weather, the looming sight of stormy grey rain clouds that frequently grace our shores. Handmade with oxidised copper wire work, this circles necklace is designed to sit gently below the collarbone. A delicate copper wire-work pendant that follows the beautiful contours of the aspen leaf. A pretty leafy design that is adorned with garnet, rose quartz and Czech glass beads, reflecting the colours of changing autumn as the aspen leaves begin to fall to the forest floor. The swirly contours are soft and elegant, inspired by ancient tree lore and the land of the faeries. This hand-made copper pendant is part of my ‘Ocean waves’ jewellery range, drawing inspiration from the rolling waves of the sea, with white crests and watery hues of greens and blues as the force of the tide stirs up the water. The design is made with oxidised copper wire detailing, adorned with droplets of Chinese jade and amazonite. This pretty oval semi-precious gemstone and copper wire necklace is inspired by the beauty found in puddles when raining. The surface of puddle water during a rain storm is magical, such movement and natural forming patterns, it’s mesmerising. The soft grey colour of the moonstone beads contrasts with the coppery metallic highlights which will draw attention to the décolletage.